Sponge Clown Noses for Clowns in Community Service at near wholesale price. 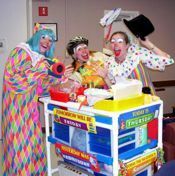 This website endeavours to show the world the wonder-filled work of care clowns who bring joy, not only to hospitals, but to communities in need all over the world. There are over 400 articles in PDF format - articles about clowns in service around the world. Please check out the newsletter archives. No one expects a clown to be profound. and Weep with the world. "Care Clowns live in the present moment away from the beating of the mind’s feet as thoughts travels back and forth in time from present to future to past. When you live in the moment you can’t help but be in awe of the universe surrounding you – the trees, the clouds, the movement of your feet on this tiny planet. . . In this awe there is a constant breeze of gratitude that humbles your heart into a place of infinite love." "As a clown I am already vulnerable -- it is my nature, so I listen with all my heart. I call it "Open Heart Listening." I hold the hands of comatose patients and hug those grieving. I have therapy sessions between a puppet and an angry child. "As wit is the humor language of the mind, joy is the humor language of the heart. The wave of joy for the caring clown is play. And that play is in Clown's innocent vulnerable character that exudes unconditional love. Unconditional because Care Clown has equal vision -- everyone, everything falls prey to Clowns exploration regardless of size, rank, profession or age. 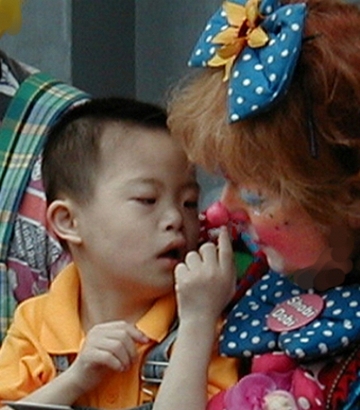 Unconditional, because the clown does not ask for anything, except maybe to participate in play. Clowns draw out the children in all of us; however, if you don't want to play, the clown moves on to the next moment. It is this pull into the moment that makes the Care Clown so valuable in hospitals and communities -- and as an ambassador of the spirit of joy that is available to everyone around the world. "All the play is spontaneous and in the clown's tradition of unconditional love. When my heart is open, the whole hospital becomes one grand "improv- sensational" play. I have learned to trust my clown character and that spirit that gives her energy. "This is the power of creating known to every artist throughout time. The difference being, our focus is the other person's heart and the connection is to the heart. The focus is on the spirit that flows through the eyes as the window to the soul, not the canvas. The rewards of this art form are not in a physical object, but in the connection to the beauty of the universal human spirit. Produced by Nikki Jackman, Founder and Cheerleader of the "UP"